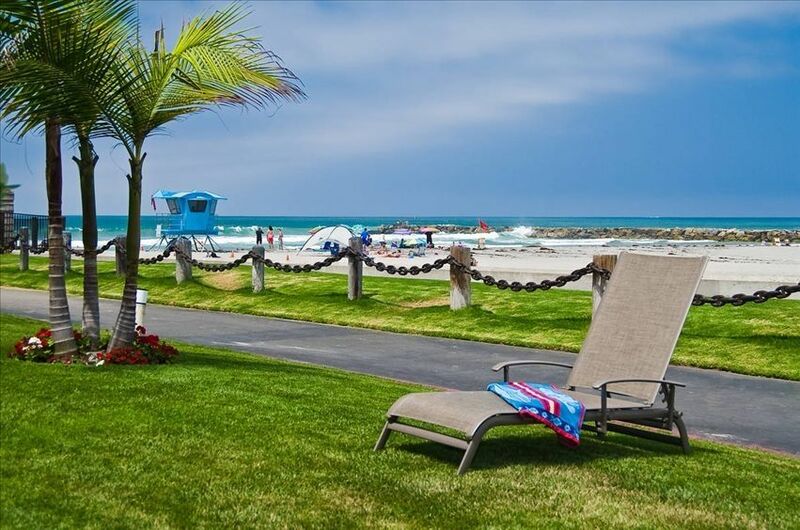 Beach Condo Oceanside Exceptional Value 2BR/2BA on the Beach! Enjoy sensational sunsets and resort style living in a ground floor corner cottage that is just steps across a lush green lawn to the sand. This fully furnished luxury condo features easy no stairs access for handy unloading/loading, and very convenient parking. The front entrance has an attractive security screen door for privacy and fresh air. The unit has been completely redecorated for comfortable living with a ceiling fan, wireless internet, flat screen TV and cable, reclining loveseat, and sleeper sofa. The large kitchen has smooth top counters and is well equipped. The master bedroom has a king bed with a beach view and the second bedroom has a queen bed with its own waterfall and garden view. Both bedrooms have ceiling fans, TVs, and beautiful Ralph Lauren bedding. My kids and I had a great time. The reason I gave it 4 stars was basically because the kitchen really lacked the proper cooking Necessities. I like renting condos to cook for my kids. There was not a full set of pots and pans and the ones that were available the teflon was peeling off which is not healthy to cook with. I feel for a low price the utensils could be replaced as well. Some of the utensils seemed very old and dirty. My only other complaint would be the tv’s in the rooms only got a few channels. The sand toys and chairs were awesome. I loved that the kids could play on the grass outside and ride their bikes on the private street. The complex is beautiful and the pool area is nice as well. I would definitely come back. The cottage condo location was perfect for view of ocean and access to beach and walks. Condo is very clean and Kathryn is a gracious hostess. We enjoyed our stay. Thank you for your kind comments. The condo does have a great view and location. I always enjoy meeting visitors and love to see them return! Beautiful place, perfect location and wonderful owner! My only reservation in giving such a positive review is that this condo might not be available the next time we want to stay there! We've been coming to NCV for over 18 years and we absolutely love this place. We are extremely grateful to Kathryn for all she did to make our stay the best it could be. Great in and out accessibility and on the beach in seconds! Thanks again for a wonderful stay. We look forward to staying with you again. Thank you for your great review and for taking care of my condo. The my condo is really perfect for people who want the convenience of no stair access and close parking with only a lawn before access to the beach! The location in the complex is central to the resort's amenities. The complex is close to many activities in the community and well as lots places to eat. I look forward to your return. The house was so comfortable and close to the beach! Kathryn takes amazing care of her property and was quick to respond to my questions. We are definitely going to return. A modest accommodation needs some updating when it comes to furniture and bedding, and it could use a full set of kitchen necessities (most notably pots and pans) but other than those nitpicks, we can't say enough about the location, service and value. Only 100 yards from the water, the endless beach walk and all other activities are perfect for couples and families. The one parking space close to the front door is a nice addition. Kathryn was always available for whatever we needed. We never used the pool because we were always at the beach, but it was full of activity. We hesitated writing a positive review because we hope it's available the next time we're in town. Thanksgiving week and December holiday weeks have a 7day minimum. February's monthly rate is $4,200. Please e-mail rental requests. Last minute rental requests are accepted. Damage deposit reserves the condo; full rent due 60 days in advance.